I’m on the outs with biscuits right now. Biscuits are the reason I am burned. Biscuits are the cause of all of my corporeal suffering in these last few days. But, dang, were they good. I was going to take a picture and show you guys the giant burn on my inner forarm from delivering biscuit babies from the hot, hot oven. But I didn’t. Even though I know you’re just dying to see a 6-inch, red, peeling burn … I’m sorry. I trust your disappointment will be allayed when I show you how to make this lovely, softening healing salve for minor scrapes and burns. I called it “Not Your Mother’s Neosporin” up there, but the truth is, it’s not anyone’s Neosporin. It has zero common ingredients – especially none of the ones that lead to Neosporin causing skin irritation. All great for your boo-boos, and your skin in general. In fact, if you wanted to use this simply as an exquisitely emollient lotion for your scruffy dry winter skin, you should! Ready for the homemade healing salve recipe? Here you go. There’s no hard and fast rule that says you have to use the same oils I used. Olive oil – alone – would work just fine. I chose coconut oil, though, because I found a study that showed coconut oil is an effective burn healing agent (and we know it’s antibacterial). And I went with grapeseed oil because the best healing balm I’ve ever used had a grapeseed oil base. Also? Check out my new beeswax beads. They look like snow. The first thing you want to do, after you’ve gathered all of your ingredients so you know you have ’em, is sterilize – with boiling water for at least 5-10 minutes – everything you’ll be using. Pots, containers, etc. Because you’re making something to be used on ouchies, definitely make sure you’re working with the cleanest tools possible. You can take the long way around this, which might give you more of the herbs’ healing properties, and let the herbs infuse the oil for 2-3 weeks (stored in a jar, in a dark area, shaken daily). That method, though, likely won’t work with solid coconut oil. So, instead, you can use the faster way here. Heat and stir the 1 cup of oil and 1/2 c. herb choice (again, I used calendula and chamomile, but you can use plantain leaves, St. John’s Wort, lavender or comfrey) on a double boiler over low heat for about 30 minutes, stirring often. This is a good opportunity to reorganize your spice cabinet. Or drink a glass of wine. Or both. After your oil has infused – and mine smelled like sunshiney chamomile – you’ll strain it. Again, make sure the vessel you’re straining it into is clean and sterile. To strain, you can use a cheesecloth, but I pulsed my herbs a couple of times in a spice grinder, just to make them easier to infuse. So I strained with a coffee filter, my second favorite strainer love. After you’ve strained your herbs, you’re ready for step 2 and almost ready to stop crying about your boo-boo. 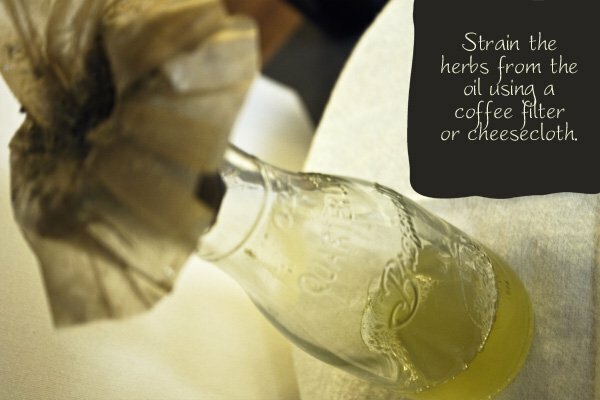 After you’ve strained your herbs, you’ll want to go back and wipe out the pot you were heating your oils in. Mainly because you’ll still have herbs sticking to the sides and bottoms, and no one wants that. Not even the herbs. Once you have a clean pot again, pour your oil back in (still using the double boiler method) and heat again on low. Then comes the beeswax. Just let that beeswax melt while you stir. Let it melt good, baby. As soon as everything is melted and incorporated and a beautiful clearish yellow color, remove the pot from the heat and get ready to pour it into your chosen healing salve container. Now, you want to work quickly here, as the salve will start to set up within minutes. At this point, you could add a few drops of lavender essential oil and stir it in well (I did this, actually, as an afterthought). Lavender essential oil is antibacterial, antimicrobial, and healing, but it also comes with one more benefit – it’s slightly analgesic. So not only will it help heal the wound, but it’ll offer you a small bit of pain relief. I needed analgesia. My arm hurts. Ouchie-wawa. Please tell me you say ouchie-wawa, too. Also, before the salve sets up, you’ll add in your amazing, fantabulous, miraculous honey (raw and unfiltered only – and local if you can). 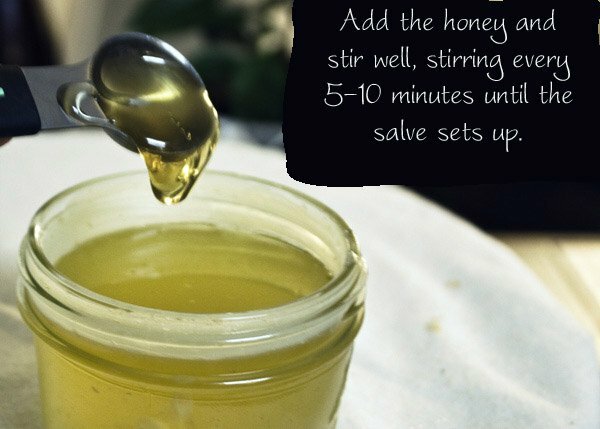 You do want to keep stirring this as the salve is setting up, or you might end up with a layer of honey at the bottom, and very little incorporated within your actual healing salve. Also, for quicker set-up, you can pop the salve in the freezer (opening to stir every few minutes). If you do it that way, you’re looking at maybe 10 minutes tops for the salve to be nicely creamy. 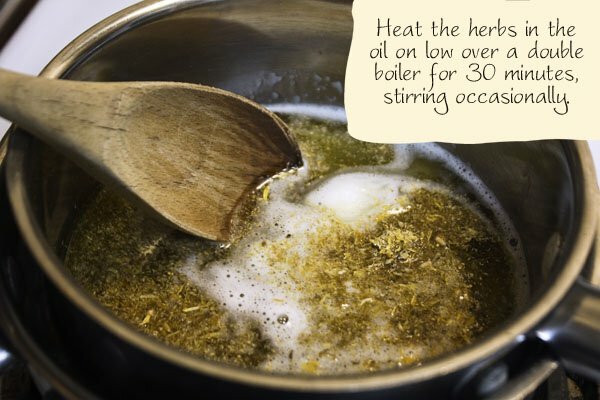 Infuse the oils and herbs over low heat on a double boiler for 30 minutes, stirring often. Strain the herbs from the oil. 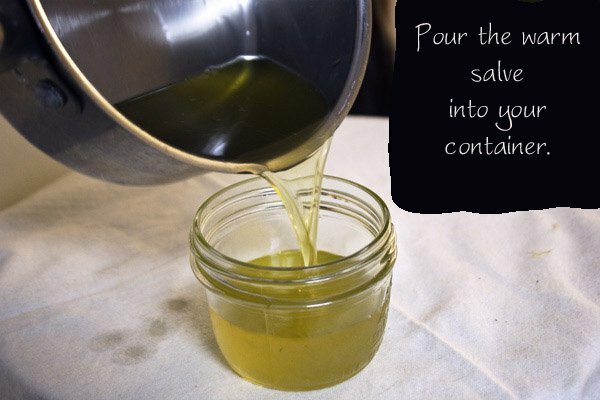 Place the oil back into the top of the double boiler and add beeswax, stirring until completely melted. Pour the mixture into a sterile container and add essential oil (if desired), stirring well. Then stir in the honey, and continue to stir the salve mixture every few minutes until it’s set up – making sure the honey is completely incorporated. This should keep in a cool, dark place for up to a year. Apply to minor scrapes and burns a few times a day until healed. Now you’re ready to make biscuits every day. Dadgum biscuits. I hate love hate love them. Oh. PS. Please make sure you’re not sensitive or allergic to any of your chosen ingredients before you apply this to your skin. Wouldn’t want to add insult to injury. Literally. Double PS. 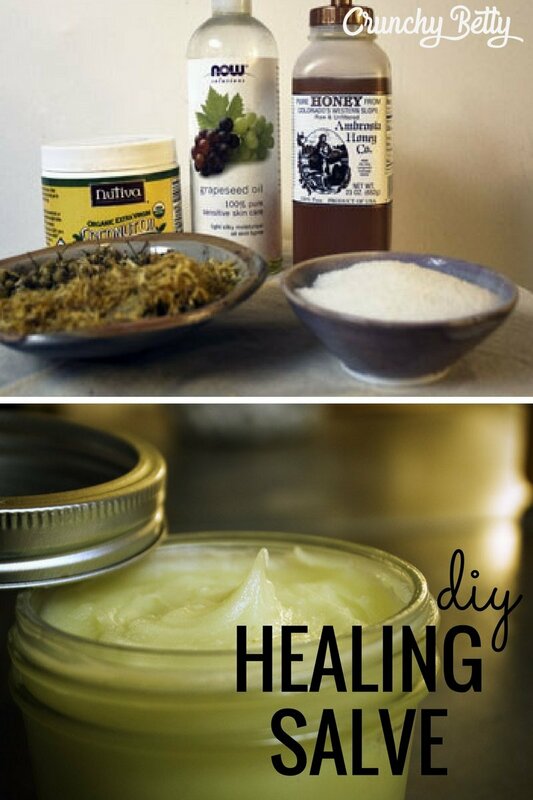 There’s more on natural remedies for scrapes, cuts, and burns over here. Love the expression ouchie-wawa and am immediately adapting it into my vocabulary. I hope your owchie-wawa wound heals quickly! One of the things I really love about your site is that it’s not heavy on using aloe vera because I’m allergic to aloe (yes I know, my granddad was in horticulture for 60+ yrs and said I’m a freak of nature to be allergic to aloe). I love that you have so many options on your site of things I can make and actually use! I was worried about this one when it mentioned plantain because I’m allergic to plantain too but then you say it could be one of those other herbs that I’m fine with so YAY! Haha, I have to use Aloe for everything since I’m allergic to Neosporen, this will be great for me. Oh, and the other day I was at a shoe store and was looking at the impulse items while I was being rung up and I stroked a pair of fuzzy-soft socks and didn’t notice until after I did that the label that said “Aloe-infused Socks” and I had to quickly wash my hands. I mean WTF I can’t even safely touch SOCKS now without having to make sure they’re not aloe. Grrr!! So going to make and use this for my little girls hands- they get SO chapped in the winter. I just discovered your site – what a treasure chest of stuff! Thank you for your fantastic sense of humour and sharing your wit and wisdom. I’m loving Mountain Rose Herbs. I was looking at Chamomile and it mentioned it’s part of the ragweed family & not good to use if you are allergic to Ragweed…no wonder my previous tries at drinking chamomile tea never made me feel better! Wow, I think I’ve exceeded my learning quota for the day! I’d be curious to hear whether the honey stays incorporated in the salve after a week or two. Due to honey’s water content (around 15-20%), I’ve found that it separates out of oil something fierce, no matter how well it initially appears to blend, unless a synthetic (icky) emulsifier is used. My honey hasn’t been separating. I use more beeswax though. That’s good to know. Would you mind sharing what beeswax to oils ratio you use? When it comes to burning myself I am a Viking- so this is perfect! Thanks again for all your crunchy-ness! 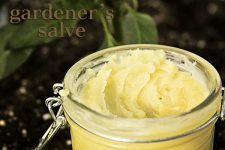 I made a similar salve for my daughter’s eczema. I should try it for first aid too, duh. She’s been using it on one arm to track it…so far it seems to be working. I’d love to hear how this goes. My bf has eczema and is so far dependent on steroid ointments to keep it in check. I’m really keen to find alternatives for him. My bf handles jet fuel at work and even with gloves gets painful looking, eczema like blisters on his hands. When he scratches, they open up and are brutal to heal. Steroid ointments didn’t help much. The first diy thing I did was work on balms for his hands. A shea butter & avocado, with vit e, whipped butter helped a bit, but is better as eye cream for me. What worked to heal the blisters is a balm similar to the CB recipe. I used calendula infused olive oil, horsetail infused grapeseed oil, some rosehip oil, beeswax, vit.e, and a few drops of tea tree oil, lemon eo, and thyme eo. This hasn’t entirely stopped the itching that precipitates blisters…when that crops I add some peppermint eo to grapeseed oil and it takes the edge off. essential oil (I used lavender and rosemary this time)Melt the oils and beeswax together in a glass jar in double boiler and after it cools down to room temp, add honey, vitamin E and essential oils, stirring occasionally until firmed up. I try to use the same jar I’m storing it in so I don’t have to try to clean up later. It is almost too hard right now, so I’m thinking of using a little less of the solid oils and beeswax and a little more of the jojoba, at least in the winter. I’ll keep you posted. She says it’s working, but I want to see the difference between arms. Has you tried altering her diet to rid her of eczema? Eczema is an external symptom of an internal problem. It’s often linked to food allergies or sensitivities, and most food sensitivities are related to poor bacterial balance in the gut. Sounds like a good high quality, full-spectrum probiotic made from organic fermented whole food may help. I’m slowly incorporating more and more crunchy bits into our home (many due to your inspiration, thanks!) But the opener for me was the magic that is pure lavendar essential oil for burns. I bake a lot but I’m not particularly graceful and I frequently burn myself so I’ve had plenty of opportunity to test it. I just keep a bottle of lavender essential oil in my kitchen and when I burn myself I just dab a little on it immediately. I haven’t had a single blister or sore since. Not even either of the times I grabbed hot stove elements moments after turning them off (brilliance, I know, don’t ask). 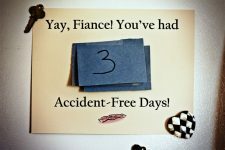 My husband is a very not crunchy or natural medicine type and even he reaches for the oil now. Ahhhhh, poop. So far I have resisted looking at Mountain Rose Herbs, but I succumbed while in class today. Aaaaanndd now there are 4 items in my shopping cart! ACK! I love your website–full of great advice, wisdom, and suggestions. I also think you’re a great writer. Keep up the great work! Hey Your Crunchie-ness, I just love reading your posts. Everyone at my office wonders why I smile and laugh so much. It is your fantastic posts that help me get through a tough work day, then I go home and sometimes (not always) try one of your great recipes. This Spring I am hoping to plant an herb/flower garden and maybe try my own herbs/flowers in my soaps/lotions. Yes! Thank you for doing this. I had not gotten around to replacing my Neosporin yet. 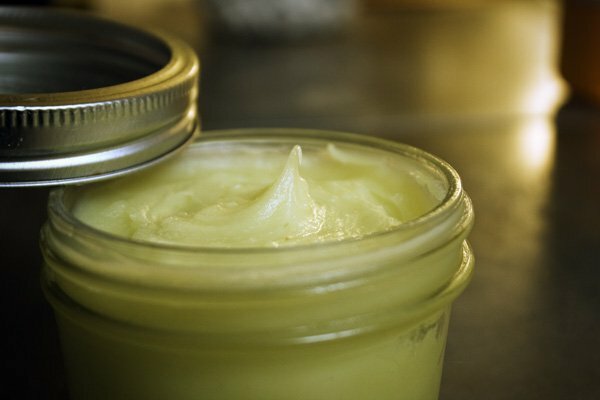 I make salves all the time but I had never considered using coconut oil instead of olive oil. Duh! Silly me. I haven’t started shipping orders yet, but I’ll be happy to work with you! Anyone who has bought calendula to use in salves etc, would you consider posting a picture of what parts of the flower are actually used. I’ve managed to grow some calendula (hurrah!) and I’ve saved the petals. When they come off the flower head, they bring a little dark fuzzy bit with them and I’m not sure if I should remove that, or if that’s where the magic is. I’d love any tips! When I buy calendula for herbal applications it is just the petals without anything attached that are sold. However, when you see the flowers being macerated here http://mountainroseblog.com/healing-calendula/ it looks like they’ve used the entire flower head. I’d say for an infusion, don’t fuss about separating the dark bits. If you are grinding the petals to add to a mask, maybe just keep the yellow bits as they grind up to a nice, fine powder on their own. I tried to post a comment with a link to a photo. The internet didn’t like that and the comment seems awol. Try going to the Mountain Rose Herb online shop. Look for Calendula Flower – there is a link to a photo of the flowers. They look like what I’ve bought from a local source. No fuzzy bits. But, if you go to the Mountain Rose Blog, they have an entry for making stuff with Calendula. The photo there shows some entire blossoms being macerated. So, if you’re planning to do the same thing I don’t think the fuzzy bits are worth the effort to remove. Oh, and a tip if you are macerating the oil..I used the stove-top, low and slow approach from the Mountain Rose blog but instead of using cheesecloth to strain it, I went for an unbleached coffee filter. I couldn’t imagine being able to get all the oil out of the cheesecloth to be able to wash and re-use it, and the coffee filter can break down in compost. The oil took a long time to filter and I left it overnight. When it was ready in the morning I did not use a body oil or butter for my legs…I grabbed the saturated filter and rubbed the non-flower side on my legs so I could get as much goodness out of that filter as possible. And then it went for composting. I grow my own calendula and I have purchased it in the past. The entire flowerhead is used, not just the petals. Let them fully dry before using in oil. Just a LAVENDER CAUTION (also tea tree oil) – there have been a few cases of hormonal effects on young boys when lavender is applied to skin (dang! They need to take it out of baby products – it’s not a secret!). After I learned that, we stopped applying to kids’ skin (and my dgtr., too for good measure), and use it to smell, and on blankets, etc. This was one study, and it was discredited for poor methodology. OMG, what great timing! I burned my arm on the oven a few days ago too, and woke up with a huge blister! I’ve never had a burn blister before, so I’ve been scouring the internet for ways to treat it. I really hope this works b/c the large bandage on my arm is getting a lot of weird stares at work! You’re the best, CB – thanks! This looks great – thanks so much! We’ve avoided neosporin for years and just put the inside of an aloe leaf on burns and owies. I’m wondering, did you leave out aloe for any reason? Also – do you think tea tree oil would be too much? Or is it an either/or thing with the lavender since the lavender has similar antibacterial properties? We use a lot of tea tree oil in this house. Tea tree oil would be fine so long as it is a medical grade. Love tea tree, and Aloe. Aloe has a lot of water in it and may make the shelf life shorter or increase the need to preserve the salve. If you want aloe too, you could keep a plant on hand and mix a little of the gel in with a small amount of the salve right before you apply it. Love this site and the recipes…. Now, if you don’t have the dried herbs on hand, could you use some essential oil instead? I’ve been using your recipe for the Best Ever Bathroom cleaner… LOVE it…it cleans so well, so fast with little hard scrubbing… BUT when I make it, I don’t use the oils as my Castile soap is lavender scented (and next time I am going scentless!!!) anyway, just using the baking soda, washing soda and castile, it hardens into big hard rocks…. still works well but hard to use… The 2nd time I tried it, same thing, so I put it into my food processor and ground ‘er all down, so now I just have little pebbles lol….. But it works!!!! Anyone else use this recipe? Any pearls of wisdom out there?? Just what I have been looking for! Thanks & Happy Trails! Thanks so much for this!! I am extra clumsy myself and with a little boy in the house and one on the way this will surely be a much needed remedy at my house!! Does anyone know if this would be good to use on a new tattoo? You need antibiotic ointment on a tattoo. Follow the tattoo parlor’s instructions. You do NOT need an antibiotic ointment on a fresh tattoo. You need to wash it regularly, keep it dry and lubricated. Contrary to what most tattoo parlors will tell you, do not use petroleum jelly as it will sit on top of the skin and prevent air from getting through, not what you want when keeping an open wound clean. Look up the ingredients of tattoo goo and simply make your own. This looks like it would help heal quite a few things – but is anybody else concerned about putting something oil based on a burn right away? Wouldn’t that sort-of insulate the burn and make it worst? If the burn is large enough for that to be a concern, put it under a cold running tap, and you should seek medical attention. 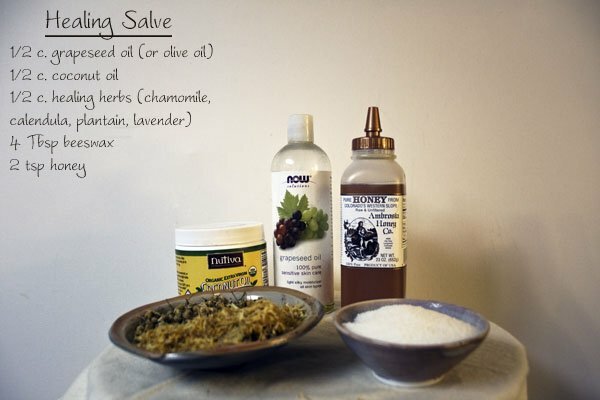 This is a suggested organic home remedy (or alternative) for what you would normally treat with an over the counter salve. I read this post last week and decided since we don’t usually have to treat cuts and scrapes (I have girly girls who ate getting dirty) that I didn’t need to make it. My daughter somersaulted down two stairs and scraped her head on concrete this afternoon. 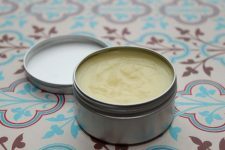 I wish I’d made this balm last week instead if scrambling to get everything together now. Should’ve went with my gut feeling. Will I ever learn that lesson? As an update: this stuff works great! My daughters head was significantly better the next day, and even better the day after that. Here we are a week later and it’s almost completely healed. It was a pretty bad scrape, too. Thanks, Betty, for developing this recipe and posting it. Any advice on scraping some up off the floor to heal your broken heart when your toddler dumps the entire batch on himself while it’s still liquid? At least any burns he got from the hot oil are already covered in healy goodness…. 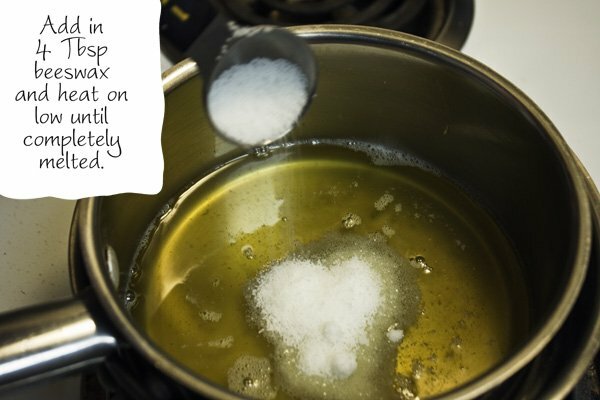 Yes – keep hot oils/waxes up high so toddlers won’t get to them! He could have gotten seriously hurt. You should try using agave nectar instead of honey. If you can’t find that, try maple syrup, golden corn syrup, or just make your own heavy sugar syrup with 3 or 4 parts sugar to 1 part water. Also, try using candelilla, carnauba, or soy wax instead of beeswax. If you decide to use candelilla or carnauba , use half as much as you would with the beeswax. I hope this helps! I would just skip the honey. It’s used in this recipe for its antibacterial properties, not as a sweetener. Healing salve does not need to taste sweet. I agree. If you use any of the sweeteners mentioned you aren’t adding to the healing properties, just making it spoil sooner. Also, if you use carnauba or candelilla or soy wax make sure it’s organic. Candelilla wax from Mexico is stored in containers that leach lead into the wax and carnauba wax is chemically extracted if it’s not organic. Soy will be genetically modified if it’s not organic. You don’t need either one. Follow the rest of the recipe and you’ll have a beautiful healing oil. Store it in a dark glass bottle and it’ll last a long time if you use coconut oil and jojoba oil (both have LONG shelf lives). Add an essential oil to extend the shelf life of the healing oil if you use other oils and/or for extra healing and scent. I love this – and you – smells like heaven, now my problem is to get myself some self-control and stop smearing every visible inch of my body with it. Another A+ grand slam! For burns, you really don’t need anything more than a good therapeutic-grade lavender essential oil. While I love making salves and such, the oil itself is all I’ve used for the last 15 or more years — and haven’t had a single blister since. The pain goes away within seconds. Your burn is obviously bigger than most of the burns I get, but even so — if it’s just a wider area, that doesn’t require different treatment, and if it’s “worse,” then several applications of lavender EO ought to do it. Try it. But make sure it’s not a lavender oil with a common brand name on it (e.g., from your healthfood store). I may just have to make some of this. I have 2 little boys who are all boy and with nice weather around the corner I’m sure i’ll see lots of boo boos soon! As well as being clumsy myself! Got anything for rashes? Teatree oil echinachea root and some kind of cream is what i mix together. Great for burns, takes the pain away from wounds, insect bites and almost whatever else you can think of, my grand daughter has asked for it for years. I make a similar salve, but add bag balm to it. Great for healing! Bag Balm also has quite a few other nasty ingredients in it besides the petroleum. Nasty stuff. 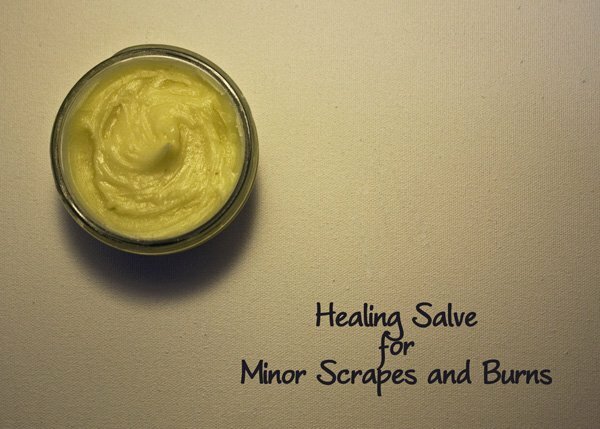 Actually, salves have been used for burns for centuries – and this is a very simple salve. Once the initial burn has cooled (during which time, of course, you should run it under cool water), it’s traditionally used to help heal the burn. The plants and other constituents have actually been shown to heal burns and minor injuries quite handily. When you add to it that Neosporin contains parabens (which accumulate in the system and are highly questionable in their synthetic forms), I wouldn’t want to apply it to an open wound and especially introduce it directly into the blood stream. My dad’s a nurse practitioner, and he uses this all the time. Also, most of the ingredients here do kill bacteria, specifically the raw honey and the lavendar EO, so yes, it does kill the bacteria. You may be a nurse dear lady, but you have a lot to learn about these awesome herbs. That remark is way off base. I recently found your site and have fallen in love! Thank you for all you’re doing. Question, several months ago, (pre-Crunchy Betty) I decided to make my own Comfrey “salve”. (LOVE Comfrey!) It’s similar to your recipe but I did not use beeswax. I used coconut oil, jojoba, E…one or two others and some essential oils. I loved it and assumed the coconut oil and E would prevent any deterioration. Not the case. It only lasts about a week then goes rancid. Does the beeswax prevent this? Thanks for your thoughts and of course anyone else who would like to give input. I would think it’s the lavender EO that does that. It is likely one of your oils was already rancid when you made the healing oil. Coconut oil and jojoba oil both have extremely long shelf lives (years). The beeswax simply turns the healing “oil” into a solid / semi-solid “salve”. I keep both on hand. I prefer the oil, but the salve is easier to apply to children and it travels better than oil. The best thing for burns from my experience is Bragg Apple cider vinegar & raw honey. I am an electrician and have been burned by capacitors etc. After I doused my burn in vinegar (it didn’t sting more, I thought it might) my hand stopped hurting in minutes. I rinsed , patted dry & put raw honey on it with a light gauze patch. It never hurt after that nor did it scar. I have used this method ever since with the same results. First of all, I have nasty blister on the back of my heel from about 4 days ago and it’s still quite the ouchie-wawa which is a phrase that I do say. Secondly, thanks to my wonderful sis in law who came to my rescue with beeswax for this little concoction, I now, happily, have this salve setting up in my freezer. It’s almost ready and I can’t wait to try it out. Thank you!! sooo does this help in fading burn scars? Cos I just have two small scars from a few months ago. Someone help me by answering 😀 Thanks! What do you think of using chamomile & calendula flower powder instead of the flowers? I’m wondering if I can add it to the oil to steep and maybe not strain it out? I used something very similar during my post partum healing period, and on my son after his circumcision. Both of us healed fast and well, surprising my midwife. We’ve used it many times since on all kinds of scrapes, scratches, bites and burns. Even on the cat. just wondering if you have to infuse the oils or if you could skip to using just essential oils for this? I have only recently started going more natural and so far I’ve had nothing but positives. Thus, I have two possibly “noob” questions about this recipe. Can I use Manuka honey in this recipe as it is touted to have better anti-bacterial properties compared to raw honey? What is the average shelf life of this salve? Well I just saw the answer to the shelf life question under the printable version. I made this salve for my sister who has just recently been thrown from a horse. She broke her collar bone and fractured some ribs and had to go into surgery for her collar bone. I’m up in Colorado and she lives in Texas and so I was a bit, actually really really really, upset about her accident sooo I made her this salve. I used Calendula, Chamomile, Lavender, and Thyme (because of your recent mention of it!) and then shipped this bad boy to her. Well she got it in the mail and used it and she told me this morning that it is actually HELPING with her NERVE DAMAGE! 😀 I am so glad that you have this site because it allows me to make hand made things for the ones I love and help them heal as well! Thanks again for the knowledge you give out freely! highest and also outlined out the whole thing without having side effect , other folks could take a signal. Would this be a good option for someone with radiation burns? I have a friend who is undergoing radiation and chemotherapy and has oozing burns on his neck from the radiation. I want to find something healing and soothing. Any thoughts? Has anyone tried using this to heal pimples after they have scabed over? I picked one the other day and I was thinking since I use neosporin to help it heal, would this work better? Can you add tea tree essential oil? Great.. I like the idea of adding honey… Melaleuca (tea tree oil) has a long list of beneficial properties. It is an analgesic, antibacterial, anti fungal, anti-inflammatory, a strong antiseptic, and antiviral and is best for your skin. Arnica would NOT be a good herb to infuse here for these purposes. Never apply Arnica to broken skin. Please do your research. Hey, I know you already have 99 responses but I thought I’d leave my own little tidbit at the bottom – may or may not have already been mentioned – but I’m halfway through the recipe (had to stop until I can get some beeswax) but I used half coconut oil, half olive oil. Did the quick-steep in the double boiler and then strained out the herbs with cheesecloth and left it out on the counter a couple of days. It hasn’t solidified at all yet, seems that melting and mixing the coconut with the olive provides just enough “stay liquid at room temp” to mess up the “solidify at room temp.” So if, for any reason, someone wants to use the slow steep method (I seem to remember reading some grumblings that the slow steep provides better/more benefits, but cannot back it up)? Just melt and mix and it seems perfectly possible!